Jim Hall (born July 23, 1935 in Abilene, Texas) is a former racecar driver and constructor from the United States. He competed in Formula One from 1960 to 1963, participating in 12 World Championship Grands Prix and numerous non-Championship races. He scored three World Championship points. Hall's special place in motorsports history came as the result of his being the "motivating force" and co-owner, with Hap Sharp, of Chaparral Cars. Based in Hall's hometown of Midland, Texas, during the 1960s, in the United States Road Racing Championship, and later in the Can-Am, Chaparral cars were the most innovative in racing. Hall was the first to use automatic transmissions in his race cars; this allowed Hall, Sharp and their co-drivers a free foot to operate moveable spoilers for aerodynamics. Hall was a very early adopter of aerodynamics applied to race cars and was the leading proponent of that technology for an entire decade. He had a sabbatical in the early 1970s, racing in several SCCA Trans-Am Series races. Hall's Chaparral Cars team came back to prominence in the Championship Auto Racing Teams (CART) series, including two wins in the Indianapolis 500 in 1978 and 1980; the latter with the first of the ground effect cars to be raced in the event. He would later turn to using off-the-shelf racecars to race in his Indycar team which was renamed "Jim Hall Racing" until 1996, when he retired from racing altogether. Hall now resides in Midland, remaining active in the oil and gas business, and motorsports racing legacies. An entire wing at the Permian Basin Petroleum Museum in Midland portrays the saga of Hall and Chaparral Cars. His son, Jim Hall, Jr., resides in California and operates the Jim Hall Kart Racing School. 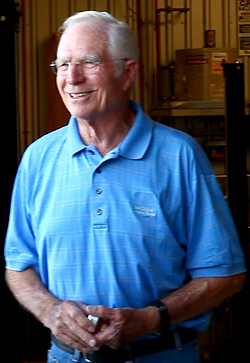 Hall was inducted into the International Motorsports Hall of Fame in 1997. Hall was inducted in the Motorsports Hall of Fame of America in 1994. Hall received the Caltech Distinguished Alumni Award in 2001. ^ "The World Championship drivers - Where are they now?". Retrieved 2007-08-13. ^ "The Formula One Archives". Retrieved 2007-08-13. ^ "Chaparral Gallery Exhibits: A Racing Legend". Petroleum Museum. Retrieved 10 October 2016. ^ "Notable Alumni, James E. Hall". This page was last edited on 9 January 2019, at 20:34 (UTC).